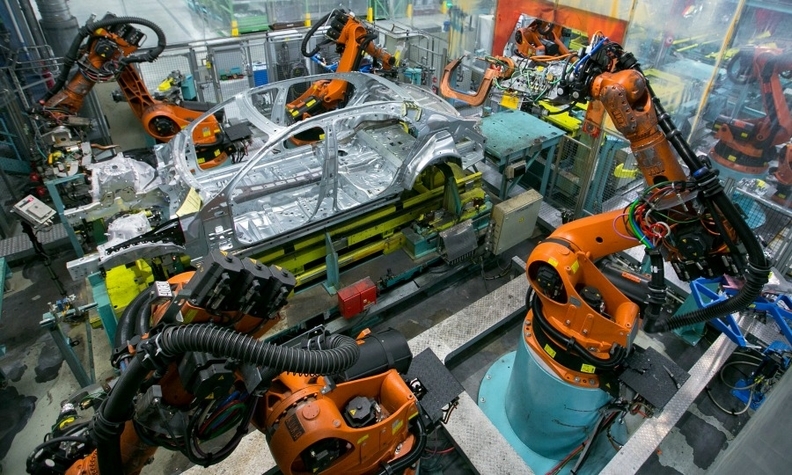 Robots work on a Mercedes S-class car at the automaker's Sindelfingen plant in Germany. MUNICH (Bloomberg) -- Mercedes-Benz offers the S-class sedan with a growing range of options such as carbon-fiber trim, heated and cooled cupholders and four types of caps for the tire valves, and the carmaker's robots simply can't keep up. With customization key to wooing modern consumers, the flexibility and dexterity of human workers is ensuring their dominance once again on Mercedes's assembly lines. "Robots can't deal with the degree of individualization and the many variants that we have today, Markus Schaefer, the German automaker's head of production, said at its factory in Sindelfingen, Germany, the anchor of the Daimler unit's global manufacturing network. "We're saving money and safeguarding our future by employing more people." The Sindelfingen plant, the manufacturer's biggest, is an unlikely place to question the benefits of automation. The factory makes elite models such as the ultraluxury S-class Maybach sedan but the 101-year-old site is far from a boutique assembly shop. The complex processes 1,500 tons of steel a day and produces more than 400,000 vehicles a year. That makes efficient, streamlined production as important at Sindelfingen as at any other automotive plant. But the age of individualization is forcing changes to the manufacturing methods that made cars and other goods accessible to the masses. The impetus for the shift is versatility. While robots are good at reliably and repeatedly performing defined tasks, they're not good at adapting. That's increasingly in demand amid a broader offering of models, each with more and more features. "The variety is too much to take on for the machines," said Schaefer, who is pushing to reduce the hours needed to produce a car to 30 from 61 in 2005. "They can't work with all the different options and keep pace with changes," he said. With manufacturing focused around a skilled crew of workers, Mercedes can shift a production line in a weekend instead of the weeks needed in the past to reprogram robots and shift assembly patterns, Schaefer said. During that downtime, production would be at a standstill. The revamped Mercedes E class, which goes on sale in March, is an example of cutting back on machines. To align the car's head-up display, which projects speed and navigation instructions onto the windshield, the carmaker will replace two permanently installed robots with either one movable, lightweight machine or a worker. While robots won't completely disappear, they'll increasingly be smaller and more flexible and operate in conjunction with human workers rather than set off behind safety fences. Mercedes calls equipping workers with an array of little machines "robot farming." Mercedes isn't doing this in isolation. Rivals BMW Group and Audi are also testing lightweight, sensor-equipped robots safe enough to work alongside people. The edge they're seeking is to be better and faster than rivals as the pace of change affecting the auto industry quickens. Cars are increasingly morphing into smartphones on wheels, and manufacturers are under pressure to upgrade their models more frequently than the traditional seven-year cycle. Automakers also need to cater to consumers demanding to be different. For Mercedes, that means adding 30 models by the end of the decade, including 10 all-new styles, and offering custom options such as bamboo trim, interior fragrances and illuminating the Mercedes star. That's a stark contrast to the days when mass-production pioneer Henry Ford quipped that customers could have any color they wanted as long as it was black. "We're moving away from trying to maximize automation with people taking a bigger part in industrial processes again," said Schaefer. "We need to be flexible."